Do You Have the Guts to Eat Yogurt? Peg likes yogurt because of its health benefits. I like it because of the taste. Health benefits are not a deciding factor for me, but they are not something I disregard. It is a superfood. Both Peg and I like Greek-style yogurt, which produces a much thicker and tangier product. Peg used to make her own yogurt. It's easy to do and it's much cheaper that paying a dollar or two for the thick and creamy Greek varieties. When we had a Finnish exchange student staying with us some years ago, she was dismayed that the selection of yogurt was very limited here in the U.S. I think we've improved. For many years the only variety was the brand name, not in texture or flavors. Different textures and consistencies are now offered. 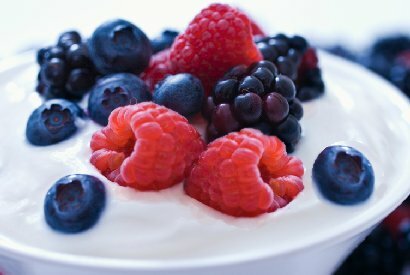 Yogurt is not necessarily a weight-loss or diet product; many yogurts are high in calories with added fat and sugars. A treat for me is a bowl of fresh berries or fruit with a liquid yogurt poured over it. If I can add a piece of Peg's short cake, I am in heaven, not a low-calorie heaven, perhaps, but heaven at any rate. I like to think that the liquid yogurt is better than whipped cream and certainly better than fake whipped cream made from oils. Yogurt is a dairy product produced by bacterial fermentation of milk. Cow's milk is most commonly used to make yogurt, but milk from other domesticated animals can be used in addition to soy milk, nut milks like almond milk, and coconut milk. Yogurt like cheese was originally produced to preserve foods for later use. Yogurt offers much more that preservation, however. Yogurt contains probiotics, live microorganisms that may confer a health benefit on the consumer. 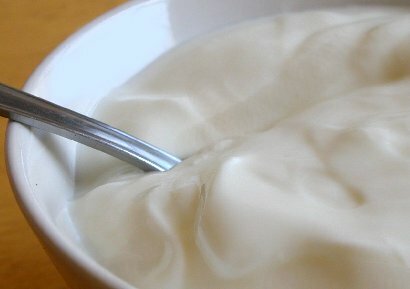 Bacterial culture is added during the process of making yogurt. The Linus Pauling Institute says, "Dietary factors other than nutrients may affect immunity, as well. For instance, yogurt and other fermented foods may contain probiotics, which are live microorganisms that benefit the overall health of the host when they are administered in sufficient amounts. Bacteria of the Lactobacilli and Bifidobacteria species are common examples. These and other probiotics can transiently inhabit the lower gastrointestinal tract and modulate immune function by interacting with intestinal epithelial cells and immune cells. Studies have shown that probiotics can benefit both innate and adaptive immunity; however, immune modulation requires regular consumption of probiotics since they have not been shown to permanently alter intestinal microflora." Hospital stays for gastro-intestinal surgery usually result in anti-biotics being administered to the patient. The results are a clearing out of bacteria in the gut system; however, we need certain bacteria in our system to help our bodies work. Yogurt is often suggested as a follow-up to G-I surgery. Regular consumption of probiotics generally results in a strengthening of our immune system and may help fight inflammatory diseases of the bowels. In our house yogurt is usually served with fruit, almonds and granola for Peg's breakfast. 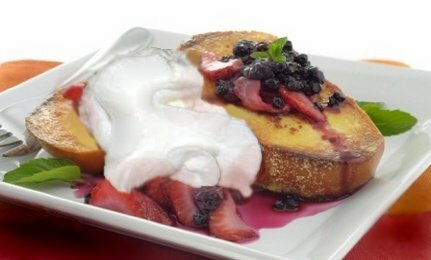 Yogurt can be added into a French toast mixture or served on top, or both. Fresh or frozen fruit is an ideal accompaniment to yogurt, but it doesn't have to be just for breakfast. Peg makes a fantastic chicken breast main dish that has yogurt and apricot-pineapple jam. The yogurt mixture goes well with a combination of brown and wild rice. There are also many strictly vegetarian dishes that use yogurt to command attention, and second helpings. 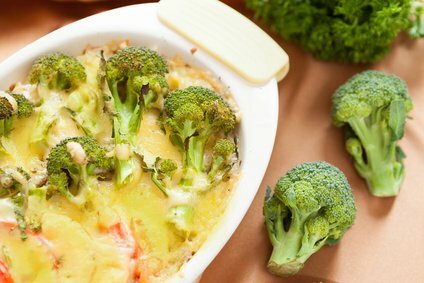 Instead of adding cheese to steamed broccoli try adding a mixture of mustard (plain yellow mustard and/or Dijon - your choice) and plain yogurt. If you really want to go all out, you could add steamed cauliflower and sliced red bell peppers as well. Salt and pepper to taste and sprinkle some toasted whole grain bread crumbs. Finish it off under the broiler and you have a main course meal you'll want to make for yourself and guests on as many occasions as your friends will permit. Do You Have the Guts to Eat Yogurt?, yogurt nutrition information, yogurt nutrition content article, Healthy Aging Article, Healthy Living Article.